Cayenne: enhances blood circulation, stimulates the digestive system and protects the body with its antioxidants from the effects of harmful chemicals. Cinnamon: helpful for reducing intestinal gas and aids in increasing blood circulation. This spice is also known to treat diarrhea, nausea, arthritis, menstrual cramps and Candida. Garlic: used to treat ear infections, influenza, blood pressure and high cholesterol, it eliminates toxins from the body and is anti-parasitic. Ginger: improves circulation use to treat colds, motion sickness nausea and morning sickness. Miso: protect the body from radiation, cancer, air pollution and toxins. Nori: sea veggie rich in vitamin A protein, B Vitamins. Quinoa: only gain that is a complete protein, high in calcium and lysine. Turmeric: found in curry powers, high in beta carotene strengthens immune system and help to dissolve cysts and tumor. Winter Squash: source for vitamin A and C and potassium. Mix tofu, spinach, cheeses, nutmeg, garlic, salt and pepper in medium bowl. Divide into 8 equal patties and dip each patty in bread crumbs. In medium fry pan, heat oil. Saut?patties, about 3 minutes on each side, or until golden. Serve in pool of marinara sauce. 1. Preheat the oven to 375°F. Put the garlic in a roasting pan and drizzle on the olive oil. Toss to coat thoroughly. Bake for 50 to 60 minutes, or until the garlic bulbs are very tender but not overly brown. Test by carefully giving a bulb a gentle squeeze while protecting your hand with a folded kitchen towel or an oven glove. Remove from the oven and allow to cool. 2. Using a sharp serrated knife, cut each head of garlic crosswise in half, midway between its leaf and root ends, to expose all the cloves inside. Their pulp will be golden brown and as soft as butter. You can squeeze it out of each half by hand or scoop it out with a small spoon or knife. Transfer the roasted garlic to a small bowl, pour in any olive oil from the baking dish, and stir and mash with a fork to form a smooth purée. You'll have 1/3 to 1/2 cup of purée, depending on the size of the garlic heads. 3. To make the Roasted Garlic Crostini, preheat the oven to 375° F. Brush the bread slices with the olive oil and arrange them on a baking sheet. Bake them until golden, 12 to 15 minutes. Remove them from the oven and let them cool to room temperature. Spread the puréed roasted garlic evenly on the tops of the crostini. Top the crostini with any of the options listed above, or make an assortment. Spread some with 1 tablespoon each of goat cheese; then decorate the cheese with strips of roasted bell pepper or a mixture of sun-dried tomato strips and capers, or a smear of tapenade. In place of the goat cheese, top others with diced tomato tossed with some fresh basil, a pinch of crushed red pepper flakes, and a drizzle of balsamic vinegar; with prosciutto and Parmesan cheese; with anchovy fillets and freshly ground black pepper; or with slices of Roma tomato and fresh mozzarella, topped with fresh basil leaves. • The roasted garlic will keep for up to 3 days, covered, in the refrigerator. • In addition to using the garlic for the crostini below, try mixing it into stir-fried vegetables and spooning it onto pizzas; stir it into risottos or your mashed potatoes; add it to sauces for meat, poultry, seafood, or pasta; or purée it with butter to make the best garlic bread you can imagine. Halve the avocado and remove the pit with a sharp knife. Discard the pit. Scoop the flesh into a small bowl and mash with a fork. Stir in the remaining ingredients, season with salt to taste, and set aside. In a food processor, combine the chickpeas, water, tahini, 5 tablespoons lemon juice, salt, and garlic and puree. While the motor is running, pour in the olive oil and process until fully incorporated. Season with pepper, to taste. Store in the refrigerator for 6 hours, for the flavors to come together. When ready to serve, remove the hummus from the refrigerator and stir in the remaining 2 teaspoons lemon juice and parsley. Transfer to a serving bowl or platter and drizzle with olive oil. Serve with flat breads and olives. Store any leftover hummus in the refrigerator for up to 2 days. enough olive oil for a inch to stir deep fry in a frying pan. Cosmopolitan once said that to eat nothing white, i.e. mayonnaise, eggs, sugar, milk, flour. So I subscribe to the theory, the less processed the better. 1) Stir flour and water into a smooth batter. 2) Combine 1/2 of toasted vegan bread crumbs. 3) Combine 1/2 iodine sea salt or powdered kelp or miso with 1/2 or to taste cayenne pepper. 4) Heat an inch of olive oil in a iron skillet-non aluminum. 5) dip tofu cubes into batter and crumb mixture then cook for 2 minute in the platter until they are honey brown. Drain the oil off and put on paper towels. Mustard sauce is not that traditional but it is better than mayonnaise for dipping. Personally although I don't like meat-tasting analogues, they are better for nutrition and also for transitional dieting purposes. My personal aim is to remain a macrobiotic therapeutic vegan. Stir the bread crumbs, 1 cup of Parmesan and 1 teaspoon of salt in a medium bowl to blend. Dip the cheese in the eggs to coat completely and allow the excess egg to drip back into the bowl. Coat the cheese in the bread crumb mixture, patting to adhere and coat completely. Place the cheese sticks on a baking sheet. Repeat dipping the cheese sticks in the egg and bread crumb mixture to coat a second time. Cover and freeze until frozen, about 2 hours and up to 2 days. Heat the oil in a large frying pan over medium heat. Working in batches, fry the cheese until golden brown, about 1 minute per side. Transfer the fried cheese to plates. Sprinkle with the remaining cheese and serve with the Marinara Sauce. Place the beans, garlic, lemon juice, 1/3 cup olive oil, and parsley in the work bowl of a food processor. Pulse until the mixture is coarsely chopped. Season with salt and pepper, to taste. Transfer the bean puree to a small bowl. Cut each pita in half and then into 8 wedges. Arrange the pita wedges on a large baking sheet. Pour the remaining oil over the pitas. Toss and spread out the wedges evenly. Sprinkle with the oregano, salt, and pepper. Bake for 8 to 12 minutes, or until toasted and golden in color. Serve the pita toasts warm or at room temperature alongside the bean puree. Place the porcini mushrooms in a bowl of hot water; press to submerge. Let stand until the mushrooms are tender, about 15 minutes. Scoop out mushrooms, being carefully not to stir any dirt that may have sunk to the bottom of the water. Discard mushroom water. Combine the porcini mushrooms, button mushrooms, walnuts, garlic, and parsley in a food processor and pulse until coarsely chopped. With the machine running, gradually add 1/2 cup of the oil, blending just until the mushrooms are finely chopped. Transfer the mushroom mixture to a medium bowl. Stir in the Parmesan. Season the pesto with salt and pepper, to taste. If not using mushroom pesto right away, cover tightly with plastic wrap to prevent possible discoloration of mushrooms. Preheat a grill pan to medium-high heat. Arrange the bread slices on pan, cut-side down. Brush the remaining 1/4 cup of oil over the bread slices. Cook until pale golden and crisp, about 5 minutes. Alternatively, you can toast the bread in the oven. Preheat the oven to 375 degrees F. Arrange the bread slices on 2 heavy large baking sheet. Brush the remaining 1/4 cup of oil over the bread slices. Bake until pale golden and crisp, about 15 minutes. Spread the mushroom pesto over the crostini. Arrange the crostini on a platter and serve. In a medium bowl, mix the eggs and cream to make an egg wash. In a separate larger bowl, mix the breading ingredients together. Cook's Note: Soy flour is made from toasted soybeans and has already been "cooked." Therefore it has a tendency to brown faster than plain flour when frying. Combine beans, tahini, oil, pepper flakes, cumin, coriander, garlic, salt, and lemon juice in food processor bowl and grind into a smooth paste. Transfer to a small dip dish and surround spread with warm pita wedges. Pop out the stem from all of your portobello mushrooms. Season both sides of mushrooms. Start by drizzling olive oil (not too much, just a slight drizzle), some salt and fresh black pepper. Cook mushrooms over a hot fire for about 4 minutes on each side. Meanwhile: Split the pieces of bread, and pull out some of the soft center to make a hole for the mushroom burger. Place the bread face down on the grill to toast. Place the mushroom burger in the bread, and top with a tablespoon of hummus and a chunk of feta cheese right in the middle and cover with a piece of bread. In a large skillet, heat the oil over high heat. Add the mushrooms. Do not move the mushrooms until they have caramelized on the bottom. If you toss them too soon, they will release their liquid and begin to steam. When the bottoms are caramelized, toss them and continue to cook for about 5 minutes. Add the butter. Cook and toss for 5 minutes, until beautifully browned. Season with salt and add the garlic. Saute another 2 minutes, and add the thyme, lemon juice, and white wine. Cook to evaporate the liquid. Toss in the parsley and serve immediately. In a mixing bowl, stir together the flour, baking powder, salt, and pepper. In another bowl, beat together the egg, milk, carrots, zucchini, and onions. Add this to the dry ingredients and stir until combined. Using a large skillet, heat 1 tablespoon of oil over medium heat. Pour the batter by tablespoons into the pan, making a few pancakes at a time. Cook about 2 minutes on each side and golden brown. Add the remaining oil to the pan as needed. Serve pancakes at once. Put the cellophane noodles, vegetables, cilantro and peanuts in a large bowl; toss with sesame oil and lime juice to give the filling some flavor; season with salt and pepper. Pour 3 cups of hot, not boiling water in a large shallow bowl. One at a time, immerse the rice paper wrappers in the hot water for 10 seconds to soften, then place on a slightly damp towel. The rice paper is very delicate, don't soak them any longer or they will break apart. Keep them covered while you work to prevent them from drying out and curling. To form the rolls, lay a rice paper wrapper on a flat surface. Grab a small amount of the cellophane and vegetable mixture and lay it across the bottom third. Use less filling than you think you should, if you overstuff the wrapper it will tear. Carefully fold the bottom of the wrapper up to cover the filling. Fold in the left and right sides, then tuck and roll it over once. Lay 2 mint leaves on top, then tuck and roll it over to close the whole thing up like a tight cigar. The mint leaves should show through the transparent rice paper. Arrange the finished rolls on a platter and cover with a damp towel. In a blender, puree the rice wine vinegar, fish sauce, hot water, sugar, lime juice, garlic, and chili paste until combined. Pour into a small bowl and serve with the summer rolls. If you’re torn between serving regular potatoes or sweet potatoes, try this spectacular dish, which calls for both. Preheat oven to 425F. Melt 1 Tbs. butter in 8-inch ovenproof nonstick skillet over medium heat. Swirl pan to coat bottom and sides; set aside. Toss sweet potatoes with 1 1/2 Tbs. butter, 1/2 tsp. thyme, 1/2 tsp. salt and 1/8 tsp. pepper in medium bowl. Set aside. Toss Russet potatoes with remaining butter, thyme, salt and pepper in second bowl. Place one layer of Russet potatoes in overlapping circles on bottom of skillet. Sprinkle with leeks, and top with layer of sweet potatoes. Sprinkle with 1 Tbs. Parmesan. Repeat layering, ending with layer of sweet potato slices. Place skillet on burner. Cook potatoes 5 minutes over medium heat to brown bottom. Transfer skillet to oven, and bake 45 to 50 minutes, or until potatoes are tender and beginning to brown. Set 9-inch plate on top of skillet. Flip upside down to unmold potatoes. Slice into wedges, and serve. Peel the potatoes and cut into 1/2-inch wedges. Dry the potatoes with a towel. To a heated skillet, add the oil. Add the potatoes, salt and pepper. Saute the potatoes for about 3 minutes, stirring to make sure the potatoes are well covered in oil. Transfer to a preheated 340 degree oven for about 30 minutes until the potatoes are golden and cooked through. After 15 minutes, toss the potatoes and continue roasting. Toss the potatoes with the parsley just before serving. Heat oil in a 12 to 14-inch saute pan, over medium heat. Add the onions, garlic and 8 ounces of sliced mushrooms and cook for 5 to 6 minutes. Add the salt and pasta with 1/2 cup pasta cooking water to the pan and toss quickly. Add the remaining 4 raw sliced mushrooms and toss again, off heat. Serve immediately, topped with the grated cheese. Place both types of flour in a large mixing bowl and stir to mix well. Make a well in the center of the flour mixture and add the water a little at a time, stirring with your hands until a dough is formed. You may need more or less water, depending on the humidity in your kitchen. Place the dough on a floured work surface and knead it like bread until smooth and elastic, about 8 to 10 minutes. Cover the dough and let it stand for 10 minutes at room temperature. Roll the dough into long dowels about 1/4 to 1/2-inch thick. Place the pasta strands between 2 hands and lightly roll back and forth to create a lightly spiraled, snake-like noodle. Place the pici on a sheet tray that has been dusted with semolina flour, cover the pasta with a clean dish towel, and set aside until ready to use. At this point, the pasta can be frozen for several months. You've probably eaten something like this in Indian restaurants-flatbread stuffed with curried vegetables. I've made these from scratch, with homemade dough, but I think they're just as good, and certainly much easier, made with store-bought flour tortillas. The potato mixture doesn't take long to prepare, less than 30 minutes. Serve alongside curries or as an appetizer with a savory dipping sauce, such as raita. 1. Place potatoes and carrot in large saucepan with enough water to cover by 1 inch, and add 1/2 tsp. salt. Boil until potatoes are soft, about 8 minutes. Drain, reserving cooking liquid, and transfer vegetables to medium mixing bowl. 2. Heat oil in large skillet. Add onion, and sauté over moderate heat, stirring often, until translucent, 6 to 7 minutes. Stir in curry powder, and cook, stirring, 15 seconds. Add 1/2 cup reserved cooking liquid to pan. Cook briefly over high heat to reduce liquid by about half, 30 seconds. Add onion with liquid to potatoes, and mash well, adding additional salt if desired. 3. Working with one tortilla at a time, spread some mashed potato mixture thickly over half the tortilla. Fold tortilla over potato mixture to close. Heat 1 tsp. oil in large skillet. Add bread, and fry over medium heat, until browned, 45 to 60 seconds. Flip bread, and cook until browned. Transfer to chopping board, and slice in half. Repeat for remaining breads. Serve immediately, or place in warm oven until ready to serve. This delicate flatbread is an example of a coca, a pizza-like speciality of Catalonia in northeastern Spain. It is hearty enough to serve as a meal, but you can also cut it into smaller rectangles to serve as tapas or appetizers. 1. Begin topping: In large skillet, heat 2 teaspoons oil over medium heat. Add onions and 1/2 teaspoon salt; cook, stirring often, until very tender and lightly browned, 20 to 25 minutes. To prevent scorching, adjust heat and add water as necessary. 2. In food processor fitted with metal blade, make dough: Combine flour, cornmeal, yeast, salt and sugar and pulse on/off to mix. In measuring cup, combine 2/3 cup hot water (120F to 130F) and 2 teaspoons oil. With motor running, gradually pour hot liquid through food processor feed tube. Process until dough forms ball, then process 1 minute to knead. The dough should be quite soft. If it seems dry, add 1 to 2 tablespoons warm water; if too sticky, add 1 to 2 tablespoons flour. Transfer dough to lightly floured surface and knead a few times. Lightly coat large sheet of plastic wrap with cooking spray and place, sprayed side down, over dough. Let dough rest 20 to 30 minutes. 4. In small bowl, cover currants with hot water. Set aside to soak about 20 minutes. Drain and stir currants into onions. Stir in vinegar and pepper. 5. In small baking pan, spread pine nuts and toast in oven until lightly golden, 3 to 4 minutes. 6. In large wide pot, cook spinach with just the water that clings to leaves over medium-high heat, stirring often, until wilted, 3 to 5 minutes. Drain in colander. Rinse with cold water and squeeze out excess moisture. Place in medium bowl and add remaining 1/2 teaspoon salt. 7. Assemble flatbread: Coat baking sheet with cooking spray and dust with cornmeal. On lightly floured surface, use rolling pin to roll dough into 16 x 12-inch rectangle, slightly less than 1/4 inch thick. Transfer dough to prepared sheet. Roll edges under to finish rim of crust. Brush remaining 1 teaspoon oil over rim of crust. Scatter spinach over crust. Top with caramelized onion mixture and sprinkle with toasted pine nuts. Lightly coat topping with cooking spray. 8. Place baking sheet on heated baking stone and bake until bottom of crust is golden and crisp, 20 to 25 minutes. Transfer to cutting board and use pizza cutter to cut into 8 rectangles. Serve hot or warm. To speed up the preparation, use a ready-made whole wheat pastry crust to line the pan. Your tart will look best if you choose tomatoes and zucchini of roughly the same diameter. Crust: Preheat oven to 400F. In large bowl, mix both flours and salt. Gradually add oil, tossing mixture with fork until crumbly. Stirring with fork, add enough milk until mixture comes together in ball. Shape into small disc. Roll out dough between two sheets of wax paper into 12-inch round about 1/4 inch thick. Remove top sheet of paper and invert dough, without stretching, into 9-inch round tart pan with removable bottom. Carefully peel off top piece of wax paper. Fit dough along bottom and up sides of tart pan and trim edges. Loosely line crust with foil, and fill with dried beans or pie weights. Bake 15 minutes. Remove foil and beans and bake until golden brown, about 15 minutes more. Transfer to wire rack and let cool. Reduce oven temperature to 375F. In large skillet, heat oil over medium heat. Add onions and cook, stirring occasionally, until golden brown, 15 to 20 minutes. Transfer to crust and spread evenly. Season with some of the salt and pepper. Add zucchini to skillet and cook until light golden, about 2 minutes per side. Arrange zucchini and tomato slices in alternate circles on top of onions, sprinkling with remaining salt and pepper. Bake until tomatoes soften, about 25 minutes. Serve warm, or transfer to wire rack to cool, then refrigerate until ready to serve. In a mixing bowl, combine cooked rice with all other ingredients. Toss mixture lightly. Serve at room temperature or chilled. This irresistible salad is crammed with hard-to-get vegetarian goodies: protein, calcium, iron—even vitamin B12. 1. To make Tofu Croutons: Preheat oven to 350F. Bake tofu 20 minutes. When dry, cut into crouton-sized cubes. 2. Beat egg in small bowl. Combine flour, garlic salt, onion powder and black pepper in separate bowl. Dip tofu cubes in egg, and dust with flour mixture. 3. Heat oil in pan over medium-high heat. Sauté tofu cubes about 10 minutes, until golden and crispy on all sides. Cool. 4. To make Salad Dressing: Combine all ingredients in nonreactive pot. Cook over medium heat 2 to 3 minutes, until sugar dissolves. Transfer to cruet. Let cool. 5. To make Spinach Salad: Place all ingredients in large serving bowl. Add half of dressing, toss well, garnish with croutons. 30 minutes or fewer Edible flowers are an irresistible way to turn fresh salads into party food. Purchase prepicked, certified edible flowers at well-stocked supermarkets. Serve with toasted cheese squares and chilled lemon tea. Combine fruits and cheese in bowl. Sprinkle with rose water; toss. Blend yogurt and chutney, and pour over salad; toss, if desired. To serve, spoon portions onto individual plates, and garnish with almonds and flowers. This summer salad is bursting with robust flavors. Try it with fresh corn on the cob or a salad of mixed greens just picked from the garden. 1. Bring large pot of water to a boil. Meanwhile, in food processor, make dressing: combine all dressing ingredients. Process until sun-dried tomatoes are coarsely chopped. Transfer to small bowl and set aside. 2. Add 1 teaspoon salt and pasta to boiling water, stirring to prevent sticking. Cook until pasta is just tender, about 11 minutes. Drain well and transfer to large serving bowl. 3. Add dressing to hot pasta and toss to coat. Let cool, stirring occasionally. Add tomatoes, mozzarella, basil, Parmesan and olives. Season to taste with salt and pepper. Toss to mix and serve at room temperature. Artisanal cheese makers across America are winning international awards for their blue cheeses, so we thought we’d honor them this Thanksgiving with a tangy salad of apples and sunflower seeds. 1. To make Cider Vinaigrette: Combine vinegar, mustard, honey, salt and pepper in small bowl. Whisk in oil and 2 Tbs. water. Stir in shallots. 2. To make Salad: Place sunflower seeds in medium-sized skillet. Toast over medium heat 5 to 6 minutes, or until browned and fragrant, shaking pan often. Transfer to small bowl, and cool. 3. Just before serving, toss spinach, sliced apple, crumbled cheese and cooled sunflower seeds with vinaigrette. Divide salad among 6 plates, and serve. Rub the inside of a large wooden bowl with the garlic cloves. Remove the garlic cloves, and finely chop. Add the egg yolks, remaining garlic, anchovies and mustard to the bowl. Whisk until all of the ingredients are incorporated. Whisk in the lemon juice. Slowly drizzle in the olive oil, while whisking constantly. Whisk until all of the ingredients are incorporated. Season the dressing with salt and pepper. Gently tear the lettuce into bit-size portions and add to the salad bowl. Using a hand-held grater, grate the cheese into the bowl. Add the croutons. Toss the salad completely and reseason if necessary. Serve the salad on cold salad plates. The American Egg Board states: "There have been warnings against consuming raw or lightly cooked eggs on the grounds that the egg may be contaminated with Salmonella, a bacteria responsible for a type of food poisoning.... Healthy people need to remember that there is a very small risk and treat eggs and other raw animal foods accordingly. Use only properly refrigerated, clean, sound-shelled, fresh, grade AA or A eggs. Avoid mixing yolks and whites with the shell." If you don't have a Caesar salad on your menu in California, the customers will rebel. For a zesty Provençal touch, the Caesar at Spago is served with croutons slathered with our homemade tapenade. When you can find baby romaine, use it. If you can't, trim the outer leaves of the larger variety and, if necessary, break them into bite-size strips. 2. Make the croutons: In a medium bowl, combine the oil, cheese, garlic, oregano, and thyme. Add the bread and toss, coating all the croutons. 3. Arrange the croutons in a single layer on a baking tray and bake until golden, turning to brown all sides. Cool and store in a cool, dry place. 4. Make the salad: Trim the lettuce and toss with some of the Caesar Vinaigrette. Arrange on salad plates and sprinkle with a little Parmesan cheese, if desired. 5. Spread one side of your croutons with a thin layer of the Black and Green Olive Tapenade. Arrange atop the salads and serve immediately. Makes 2 to 4 servings. Braise the onion and celery in 1/2 cup water. Add the cans of beans including the juice in the cans. Add the remaining ingredients. Heat the oil in a large heavy pot over medium heat. Add the onions, shallots, bell peppers, eggplant, squash, and garlic and saute until tender about 3-5 minutes. Add the tomatoes. Season with salt and cayenne. Add the bay leaves. Add the rice and stir for 2-3 minutes. Add the water, stir and cover. Cook for 30-35 minutes, or until the rice is tender and the liquid has been absorbed. Do not stir during this cooking time. Remove from heat and let stand for 2-3 minutes. Add the green onions and mix. In a medium pot over moderate heat saute garlic and mushrooms in extra-virgin olive oil for 2 or 3 minutes. Add zucchini and onion to the pot and season vegetables with salt and pepper. Saute another 5 minutes. Add beans, cumin, tomato and chopped rosemary. Bring stew to a bubble, reduce heat to low and simmer 10 minutes. Heat a nonstick skillet over medium high heat. Add a thin layer of olive oil or vegetable oil to the pan, just enough to coat the bottom. Combine potatoes with onions and flour. Mix in shredded cheese. Spoon piles of potato and cheese mixture into the pan, making 3-inch rounds, 1-inch apart. Cook cakes until golden and crispy, about 4 minutes on each side. Remove cooked cakes and repeat process. Arrange cakes, 3 per person, on dinner plates and top with ladles of mushroom and zucchini stew. This Tex-Mex great pleaser is another vegetarian happy medium to please meat eaters and meat-free-ers alike. Over moderate heat, add oil to a deep pot and combine onion, peppers, and garlic. Saute for 3 to 5 minutes to soften vegetables. Deglaze pan with beer or broth, add tomatoes, black beans, red kidney beans, and stirring to combine. Season chili with cumin, chili powder, hot sauce, and salt. Thicken chili by stirring in refried beans. Simmer over low heat about 5 to 10 minutes longer, then serve up bowls of chili and top with shredded cheese, scallions, and tomatoes. Place bowls on charger plates piled with assorted tortilla chips. In a medium saucepan, bring the vegetable stock to a simmer. Lower the heat to keep warm. In a medium pot, heat the olive oil over medium-high heat. Add the onions, peppers, and celery and cook until soft, 4 to 5 minutes. Add the garlic and farro to the pan and cook, stirring, until the faro is toasted and coated with oil, 3 to 4 minutes. Add the tomatoes, mushrooms, okra, baby carrots, zucchini, bay leaf, and thyme, and cook, stirring, for 2 minutes. Add 2 cups of the warm stock, salt, black pepper, and cayenne, and bring to a boil. Reduce the heat to medium-low and simmer, stirring, until the liquid is absorbed. Continue adding the stock, 2 cups at a time, as the previous addition is absorbed, cooking and stirring, until all the stock is used and the grains are plump and tender. Remove from the heat and discard the bay leaf. Stir in the parsley and adjust the seasoning,to taste. Serve immediately. To make the "dashi" soup stock, in a large saucepan, combine the konbu and vegetable stock and heat over medium-low heat almost to the boiling point. Remove the konbu just before the mixture comes to a boil and discard. Remove from the heat and skim any foam that rises to the surface. Let stand for 2 minutes. Strain through a fine mesh strainer into a saucepan. Keep warm over low heat. Add the mushrooms and soy sauce to the dashi and steep until mushrooms are tender, about 10 minutes. Remove with a slotted spoon, and when cool enough to handle, slice thinly. Return to the liquid. Add the miso pastes and cook over low heat, stirring to dissolve. Add the scallions and tofu and cook until warmed through, about 3 minutes. A smooth, satisfying soup that's great as either a silky starter or a light meal. Serves two. Melt butter in a heavy saucepan over medium heat. Add onion, mustard seeds, and salt and pepper. When the onion starts to soften, add broccoli and carrot and cook until vegetables are soft. Add 1 c. water and simmer covered for 15 to 20 minutes, or until broccoli is very tender. Pur�e soup in batches until smooth. Transfer soup to a heavy saucepan. Stir in veggie broth. Heat soup over moderately low heat, and whisk in sour cream. Garnish with julienned carrots and a sprig of Italian parsley. *Italian (or flat-leaf) parsley is commonly available in supermarkets. It's considered more refined and flavorful than curly parsley. Strip kale leaves from stalks, and rinse thoroughly in colander; set aside. Heat oil in a 5-quart Dutch oven or saucepan for 1 minute over medium-high heat. Add garlic, onions and peppers, sauté for 2 minutes and add potatoes. Cook for 4 minutes, and add vermouth, mushrooms and cauliflower. Cook for 2 minutes, add kale and mix thoroughly. Cook mixture for 5 minutes, and reduce heat to low. Chop stewed tomatoes coarsely in food processor, and add tomatoes, thyme and yeast to kale mixture. Combine cornstarch and water in a small bowl, and stir in with tamari and lemon pepper. Cook for 5 minutes, stirring occasionally. Remove from heat, and serve. Fresh herbal overtones boost the flavor of this ready-when-you-are soup. White beans make a deliciously creamy base for soups, sauces and stews. Meal Plan: Make the soup, then put together a tossed salad of shredded lettuce, finely diced tomatoes and bell peppers, and sliced olives. Dress in your favorite natural low-fat dressing and have each person make his or her own "salad wraps" using large warmed flour tortillas or soft lavash wraps. End the meal with fresh strawberries topped with a nondairy frozen dessert. 1. In food processor, purée half of beans until smooth. Add tomatoes with their liquid and scallions, and purée until smooth. 2. Transfer purée to a large saucepan. Stir in remaining beans, broth, cilantro, seasoning mix and pepper. Warm through over low heat, stirring occasionally. Serve hot. Place ears of corn on the grill. Grill for around 2 minutes on each side. When slightly browned, remove from heat and roll in basil chive butter. Sprinkle with grey salt. 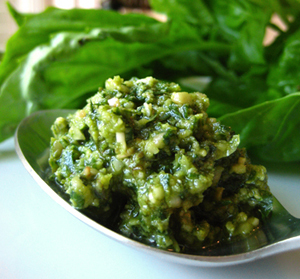 Puree the basil, ascorbic acid, salt and pepper, and butter in a food processor. If the mixture is too dry to puree, add just enough water to ease the process. Puree until smooth and well blended. Taste and add more salt if desired. Refrigerate until firm enough to shape into a log. Place potatoes in a medium pot and cover with cold water. Bring to a boil, heat to a simmer. Add a generous pinch of salt and continue to simmer until potatoes are fork tender, about 20 minutes. When potatoes are done, drain and return potatoes to pot to dry slightly. Run potatoes through food mill or potato ricer into pot. Heat milk in saucepan. Add hot milk to potatoes, over heat, until smooth. Add butter and heat until finely textured and fluffy. Arrange garlic in 1 layer on a double thickness of foil and wrap tightly. Roast the garlic and potatoes in middle of oven--the garlic will take 45 minutes and the potatoes will take 1 hour. Combine the milk and butter in a large bowl. Scoop the flesh from the potatoes into the bowl and smash using a potato masher. Reserve the skins and julienne them. Drizzle the skins with the olive oil, transfer to the oven, and bake until crisp, about 12 minutes. Using a rubber spatula, mix the potato mixture and garlic together until creamy. Fold in the basil and season with salt and pepper. Garnish the smashed potatoes with the crisp potato skins. Place veggies in a pan with water and vinegar. Bring to a boil and cover. Reduce heat to medium and cook 10 minutes. Remove lid and raise heat back up. Allow the water to boil away and the vinegar to reduce and glaze the veggies, about 5 to 7 minutes. When the vegetables are glazed, to a sweet, rich brown color add butter to the pan. Turn veggies to coat lightly with butter. Season with salt, pepper and serve. Garnish with parsley. For an optional glaze for the vegetables, substitute 1/4 melted butter and 1/4 cup honey for 1/2 cup balsamic vinegar. Follow method as listed. Cook green beans in boiling salted water until tender, about 3 or 4 minutes. Drain well. Heat olive oil in a large skillet over medium heat. Add mushrooms and cook until browned, about 3 to 4 minutes. Add the garlic and thyme. Season with salt and freshly ground black pepper, to taste. Cook until garlic is fragrant, about 1 minute. Add brandy or cognac, red wine and chicken broth, bring to a boil. Simmer to blend flavors and reduce sauce, about 2 to 3 minutes. Add green beans to mushroom sauce and toss to coat. Place on a large serving dish, season again with salt and pepper, to taste. Top with fried onions before serving. Heat peanut oil in a deep fryer or deep pot to 375 degrees F.
Put onion rings in a large bowl. Pour buttermilk over onions and toss to coat. Shake off the excess liquid. Fry the onions in small batches until crispy, about 2 minutes per batch. Scoop out with a slotted spoon and drain on paper towels. Set aside. Season with salt, to taste. Grind the rice in a blender or spice grinder to a very fine powder. Put it in a bowl and add the flour, semolina, salt and pepper. Toss until well blended. Store in a sealed container in the freezer for maximum freshness. Place 1 slice of green tomato in each glass. Halve or quarter the bocconcini if they are larger than 1 inch in diameter. Thread a bocconccini, and a cherry tomato onto each of 4 wooden skewers 4 to 5 inches long. Season with salt and pepper and drizzle with basil oil, if desired. Working quickly, divide the tomato liquid among the chilled martini glasses. Balance the skewers on top of the glasses, then take a leaf of basil per glass, and rub it around the glass rim, before placing on top of each glass, near skewer. Serve immediately. *Cook's Note: It is impossible to give a specific amount for the tomatoes because how much "water" a tomato releases depends on many factors, including the growing season and the variety. Do not let the tomato pulp go to waste. Use this recipe as an excuse to start your quick tomato sauce season. You can freeze or can your sauce and then have it on hand for quick meals. Bring 2 large pots of water to a boil. Lower the tomatoes into the water, blanch for 45 seconds to 1 minute. Place blanched tomatoes on a baking sheet, and peel the loosened skins. With a colander over a bowl, squeeze the seeds and innards out of each tomato. Set aside and refrigerate the clear strained liquid for other uses. Slice the peeled tomatoes into 1-inch chunks, and place chunks into blender. Puree thoroughly. Pour into bowl. Saute the squash in a little vegetable oil over medium-low heat until it has completely broken down, about 15 to 20 minutes. Line a colander with a clean tea towel. Place the cooked squash in the lined colander. Squeeze excess moisture from the squash. Set aside. In a medium size skillet, saute the onion in butter for 5 minutes. Remove from pan and mix all ingredients together except cracker crumbs. Pour mixture into a buttered casserole dish and top with cracker crumbs. Bake for 25 to 30 minutes. Preheat the oven to 350 degrees F. Butter a 9 by 13-inch casserole. Steam the broccoli until tender, about 10 minutes. In the meantime, melt the butter in a medium skillet over medium heat and saute the celery, mushrooms, and onion until softened, about 10 minutes; drain. Combine the broccoli and the cooked vegetables in a bowl. Heat the soup and softened cheese product in a saucepan over low heat until the cheese melts. Pour it over the broccoli mixture. Add the garlic salt and pepper and combine. Put it into the buttered casserole dish and bake for 20 to 25 minutes. Sprinkle the top with the grated Cheddar the last 5 minutes of baking. Place potatoes in a large pot and cover with water. Bring to a boil, generously salt the water, and boil the potatoes until tender, approximately 30 to 40 minutes. Drain and let stand until cool enough to handle. Peel potatoes, if desired, and cut into 1-inch chunks. Place cut potatoes in a large bowl. Sprinkle parsley and green onions over potatoes. Make the sauce by mixing the rest of the ingredients together in another bowl; then pour sauce over the potatoes. Stir well. Let stand all day, or at least for 4 hours, stirring every hour. Do not refrigerate. Serve at room temperature. Put the lentils and barley in a saucepan with cold water to cover by about 2 inches. Season with salt, and bring to a boil over high heat; reduce the heat and simmer, uncovered, until the lentils and barley tender, about 20 minutes. Drain excess liquid and put the beans and grain into a large bowl. Cool. Meanwhile, melt the butter in skillet over medium heat and cook the onion, garlic, and ginger until the onion is tender, about 4 minutes. Stir in the curry powder and cook until aromatic, about 1 minute more. Cool slightly and then add to the lentils and barley. Stir the cilantro, bread crumbs, and eggs into the lentil mixture, and season with 1 teaspoon salt and pepper, to taste. Puree 1 cup of the burger mix in a food processor until smooth. Return purree back to the bowl and mix well. Form mixture into 6 burgers (about 1/2 cup each). Place on a plate and refrigerate for 1 hour. Heat 1 tablespoon of the olive oil in a nonstick skillet over medium-high heat. Season burgers with salt and pepper and cook 3 burgers, turning once, until golden brown on both sides, about 5 minutes in all. Transfer the browned burgers to a baking sheet. Repeat with the remaining oil and burgers. Transfer burgers to the oven, and cook until firm, about 10 minutes. Using a pastry brush, brush olive oil on the vegetable slices and the portobello mushrooms. Season them with salt and pepper. Place vegetables on a hot grill and cook until they are tender. Once vegetables are done brush sliced bread with olive oil and grill on both sides. To assemble, slice portobellos into 1/4-inch slices, spread both sides of the grilled bread with herbed mayonnaise and then top with 1 slice each of grilled vegetables and a quarter of the mushrooms, and finish off with lettuce and top with remaining piece of bread. Combine all ingredients in a food processor and pulse. Cut the top off a loaf of crusty bread. Hollow out the inside of the bread. Mix chopped sun-dried tomatoes, chopped olives and store bought or homemade pesto sauce. Spread the mixture evenly across the bottom of the hollowed out bread. Layer the cheese into the loaf. Layer the roasted red peppers on top of the cheese. Coarsely chop the drained artichoke hearts and add them in a layer over the red peppers. Sprinkle in the chopped hot pickled vegetables and drizzle some extra-virgin olive oil on top. Replace the top, cut the stuffed loaf into pieces and serve. When I became vegetarian, i missed the weirdest things, and one of those things was chicken and tuna salad sandwiches. This is a good substitute, because with the mustard, mayonnaise, and relish, you can hardly tell what the main ingredient is anyway. Non-vegetarians will like it too! This is a very child- and teen-friendly recipe, though anyone who is a child at heart will enjoy it. Texturized soy crumbles aim to imitate ground beef, but it's not so much the flavor as the texture that does the trick. In large skillet, heat oil over medium heat. Add onion and cook, stirring occasionally, until softened, 3 to 4 minutes. Add bell pepper and cook until onion is golden and pepper begins to soften, stirring often, about 5 minutes. Add soy crumbles and increase heat to medium-high. Cook, stirring often, until thoroughly heated, 3 to 4 minutes. Stir in pizza sauce and cook, stirring occasionally, until hot and flavors are blended, about 3 minutes. Serve sloppy joe mixture hot on buns, open-faced or as a closed sandwich. In a saute pan over medium heat, add extra-virgin olive oil. When almost smoking, add the onion and cook until soft, about 5 minutes. Add the carrot and cook for 3 minutes. Add the zucchini and squash cook for 5 minutes. Add asparagus and cook for 2 minutes. Remove from heat when all vegetables are completely cooked but still have a good crunch. Allow to cool. Using a 6-inch round cookie cutter, cut circles out of the lasagna sheets. You will need 18 circles. Coat the bottom of 6 (6-inch) gratin dishes with a teaspoon of tomato sauce in each. Place a circle of pasta on the bottom of each ramekin. Rinse the beans with water and season with salt and pepper. Divide the beans between each ramekin. Next, divide the spinach between the ramekins. Place a second layer of pasta on top and gently press down. Divide the sauteed vegetables among the ramekins and top with a tablespoon of tomato sauce in each. Place the third layer of pasta in each ramekin and coat with a tablespoon of tomato sauce. Sprinkle ramekins with the mozzarella and Parmesan cheeses, and top each with 1/2 tablespoon of butter. Line a baking sheet with aluminum foil and place gratin dishes on top. Bake in oven for 20 minutes or until brown and bubbling. Heat oven to 375°F. Mix goat cheese, olives, thyme, basil, oregano, and garlic in a bowl; season with salt and pepper. Spread 1 cup pasta sauce on the bottom of an 8" x 11" baking dish. Add one layer of lasagna and season with black pepper. Add a layer of zucchini, squash, and red pepper. Dollop spoonfuls of goat cheese mixture over vegetables and spread to cover. Repeat layers, finishing with pasta and sauce. Sprinkle Parmesan on top, cover with foil and bake 40 minutes. Uncover and bake 5 minutes or until top browns. Let stand 10 minutes; serve. Put oven rack in middle position and preheat oven to 375°F. Butter a shallow 2-quart baking dish. Cook onion in 1 1/2 tablespoons butter with a pinch of salt in a 12-inch heavy skillet over moderately low heat, covered, stirring occasionally, until softened, about 5 minutes. Increase heat to moderately high and add mushrooms, then sauté, stirring occasionally, until mushrooms begin to give off liquid, about 2 minutes. Add soy sauce and continue to sauté mushrooms, stirring, until liquid mushrooms give off is evaporated. Add Sherry and boil, stirring occasionally, until evaporated. Remove from heat. Melt remaining 3 tablespoons butter in a 2- to 3-quart heavy saucepan over moderately low heat and whisk in flour, then cook roux, whisking, 3 minutes. Add broth in a stream, whisking, and bring to a boil, whisking. Whisk in milk and simmer sauce, whisking occasionally, 5 minutes. Stir in mushroom mixture, lemon juice, and salt. Add lightly saute' tofu into sauce and stir gently. Season sauce with salt and pepper. Cook noodles in a 5- to 6-quart pot of boiling salted water until al dente. Drain noodles in a colander and return to pot. Add sauce and stir gently to combine. Transfer mixture to baking dish, spreading evenly. Toss together bread crumbs and cheese in a bowl. Drizzle with oil and toss again, then sprinkle evenly over casserole. Bake until topping is crisp and sauce is bubbling, 20 to 30 minutes. In a large casserole pot or Dutch over, heat oil over medium high heat. Add onion and garlic and saute until soft and translucent, about 5 to 10 minutes. Add celery and carrots and season with salt and pepper. Saute until all the vegetables are soft, about 5 to 10 minutes. Add tomatoes and bay leaves and simmer uncovered on low heat for 1 hour or until thick. Remove bay leaves and check for seasoning. If sauce still tastes acidic, add unsalted butter, 1 tablespoon at a time to round out the flavors. Add 1/2 the tomato sauce into the bowl of a food processor. Process until smooth. Continue with remaining tomato sauce. If not using all the sauce, allow it to cool completely and pour 1 to 2 cup portions into freezer plastic bags. This will freeze up to 6 months. In a medium skillet over moderate heat, saute mushrooms, chopped onions, and garlic in oil until mushrooms give off their juices and darken and onions are tender, about 7 or 8 minutes. Season with salt and pepper; the salt will help draw water out of the vegetables as they cook. Add dry chopped spinach to the pan and heat through for 1 minute. Adjust seasonings with salt, pepper, and a little nutmeg. Add ricotta and stir into mixture to heat cheese through, 1 minute longer. Remove pan from heat but leave in the warm skillet. Heat broth in a small pan over moderate heat. Melt Gorgonzola into broth and bring liquid to a bubble. Stir in cream and thicken sauce 2 minutes. Place cooked lasagna noodles on a large work surface or cutting board. Spread lasagna noodles with a layer of spinach-mushroom filling. Roll up pasta and arrange the 8 bundles in a shallow casserole dish. Pour warm sauce over roll-ups and top with mozzarella. Place casserole under broiler to melt cheese. Serve with steamed asparagus and broiled tomatoes. While you boil your lasagna noodles, place fresh asparagus tips in a small colander over the boiling water in the pasta pot. Place a lid on the colander and steam asparagus while you are cooking your pasta for 4 minutes or until tips are just tender. Split 4 vine ripe tomatoes across the center and drizzle with extra-virgin olive oil, salt, and pepper. Broil tomatoes. Serve along side your completed casserole. Top with any fresh herb you have on hand: basil, thyme, or rosemary. Heat a medium nonstick skillet over medium heat. Add the oil and the sliced mushrooms to the hot skillet. Season mushrooms with black pepper, salt and thyme. Saute the mushrooms 10 minutes or, until dark and tender, then remove from heat. Transfer the mushrooms to a dish and return the skillet to the stove over medium heat. Add another turn of extra-virgin olive oil to the skillet and add the onions, garlic and jalapeno pepper; saute for 2 or 3 minutes, then add beans and corn to the pan. Stir in chopped tomatoes and barbecue sauce, then season salsa with salt and pepper. Transfer warm salsa to a serving dish. Heat a griddle pan or large nonstick skillet over medium to medium high heat. Add a drizzle of oil to the pan and 1 flour tortilla. Cook tortilla 1 minute, then turn it over. Sprinkle 1/2 cup sharp cheddar over 1/2 of the flour tortilla. Cover the cheese with 1/4 of the cooked sliced mushrooms. Fold the plain 1/2 of the tortilla over top of the filling and gently press down with a spatula. Cook the filled quesadilla 30 seconds to a minute longer on each side to lightly brown and crisp the quesadilla and melt the cheese. Remove the quesadilla to a large cutting board or transfer to a warm oven to hold, then repeat with remaining quesadilla ingredients. Cut each quesadilla into wedges and serve with warm salsa for topping. Heat oil in a saucepan over medium heat. Cook 2 c. of the onion and the garlic in the saucepan until tender. Add the cashews and 1 1/2 c. of the bread cubes to the onion. Add vegetable stock, salt, pepper, nutmeg and lemon juice. Place half the bread mixture in a small non-stick loaf pan. Set aside. Combine toasted bread cubes, margarine, the remaining onion, celery, thyme, marjoram, sage, parsley and salt to taste in a mixing bowl. Put this mixture on top of the mixture already in the loaf pan. Add what is left of the first mixture to the loaf pan so that there are three layers of mixtures. Put the pan on a baking sheet and bake 30 minutes, or until top is browned. Let the roast cool 5 minutes, then turn out onto a serving platter. Serve with gravy, if desired. Preheat a 8 inch pot with a tight fitting cover over moderate heat. Add oil, onion and garlic and saute for 2 or 3 minutes. Add broth to the pan and bring to a boil. Stir in orzo and return broth to a boil. Cover pot and reduce heat to simmer. Cook 15 minutes, stirring occasionally, or until liquid is absorbed and pasta tender. Remove lid and stir in cheese. Season with salt and pepper to your taste. You favorite fresh herbs may also be stirred into the orzo or rice to strengthen the flavor even more. Preheat oven or broiler to 450 degrees F.
Bring a large pot of water to a boil. Salt water and add pasta. Cook shells 12 to 15 minutes, they should be softened but still undercooked at the center. Drain pasta and cool. Combine ricotta, 1/2 of the diced mozzarella, a couple of handfuls of Parmigiano and 1/2 of the Asiago. Add parsley to the cheeses and stir to combine. Pour a little sauce into the bottom of a shallow medium sized casserole dish. Fill shells with rounded spoonfuls of cheese mixture and arrange them seam side down in casserole dish. Top shells with remaining sauce and remaining mozzarella and Asiago cheeses. Place shells in very hot oven or 8 inches from hot broiler and cook 6 to 8 minutes to melt cheeses and bubble sauce. These are so easy and SO good. All you do is , sauté the beans, corn, onion, green chilis, salt, pepper and cumin in a large skillet over med heat for about 5 to 10 minutes. Then fill the corn tortillas with the bean mixture and place in a baking dish. Cover with the enchilada sauce and some shredded cheese. Cover with foil and bake for about 30 minute at 350. I serve them with spanish rice and salad and maybe chips and salsa. In a large pot, bring the veggie broth and salt to a boil over medium heat. Gradually whisk in the cornmeal in a slow steady stream. The liquid will be absorbed and the cornmeal will lock up; don't freak, just whisk through it. Lower the heat and continue to whisk until the polenta is thick and smooth, about 20 minutes. Add the cream and 2 tablespoons of the butter; continue to stir until incorporated and creamy, about 5 minutes; season with salt and pepper. Remove the polenta from the heat and pour it into a small baking dish. Place a small skillet over medium heat and add the remaining 2 tablespoons of butter. Swirl the pan over the heat and cook the butter until golden and nutty, about 1 minute. Add the raisins and pine nuts, tossing to coat in the brown butter. Pour the raisins and pine nuts over the top of the polenta and sprinkle with the Parmesan. Bake for 25 minutes and serve. In a large pot of boiling salted water, cook the pasta until just al dente, 8 to 10 minutes. Drain in a colander, return to the pot, and cover to keep warm. Meanwhile, in a large skillet or sauté pan, heat the oil over medium-high heat. Add the shallots and garlic, and cook, stirring, until soft, about 2 minutes. Add the tomatoes and pepper flakes and cook, stirring, until thickened, 4 to 5 minutes. Add the vodka and cook until reduced to about 3 to 4 tablespoons, about 3 minutes. Add the cream and cook until thickened, 2 to 3 minutes. Remove from the heat and adjust the seasoning, to taste. Add the cooked pasta to the sauce and toss to coat evenly. Transfer to a large serving bowl and garnish with the basil and top with a sprinkling of the pecorino cheese. Pour out enough vodka from the bottle in order to make room for the peppers and reserve for another use. Carefully add the peppers and garlic to the vodka, pouring out more liquid if need be. Cap and let stand at room temperature until the vodka acquires the desired heat, about 1 week. Serve, or remove the peppers and keep in the freezer. In a large pot of boiling salted water, cook the pasta until al dente. Drain and return to the pot. Cover to keep warm. Meanwhile, in a large saute pan, heat the oil over medium-high heat. Add the mushrooms and cook, stirring, until soft, 3 to 4 minutes. Add the shallots, garlic, thyme, salt, and pepper, and cook, stirring, until fragrant, 2 minutes. Add the cream, increase the heat to high, and bring to a boil. Reduce the heat and simmer until the sauce thickens enough to coat the back of a spoon, about 5 minutes. Add the Parmesan and adjust the seasoning, to taste. Add the pasta, stir to coat with the sauce, and cook until the pasta is heated through, 1 minute. Remove from the heat and divide among 4 serving bowls or plates. Sprinkle each serving with chives and serve immediately. In a large heavy pot, heat the oil over medium-high heat. Add the onions and cook, stirring, until soft, 4 to 5 minutes. Add the garlic and red pepper flakes. Stir until fragrant, about 30 seconds. Add the tomato paste and cook, stirring, for 1 minute. Add the garlic puree, and cook, stirring, for 30 seconds. Add the tomatoes and their juices, tomato sauce, hot sauce and sugar. Bring to a boil, stirring occasionally. Reduce the heat to medium-low and simmer uncovered, stirring occasionally, until thick and fragrant, 30 minutes. Remove from the heat and cover. Bring a large pot of salted water to a boil. Add the pasta and cook until just barely al dente, 8 to 10 minutes. Drain and transfer to the pot with the sauce. Add the lemon juice and bring to a simmer and cook until the pasta is well coated and warmed through, about 3 minutes. Transfer to a large, decorative pasta bowl and toss with the basil and 1/2 cup of the cheese. Garnish with parsley. Serve immediately and pass the additional 1/4 cup of cheese at tableside. Preheat the oven to 325 degrees F. Line a baking sheet with parchment or aluminum foil. Cut the top quarter from each head of garlic and place, cut side up, on the prepared baking sheet. Drizzle the oil over the cut garlic tops, and sprinkle with the salt and pepper. Turn the garlic cut side down, and roast until the cloves are soft and golden brown, about 1 hour. Remove from the oven and let sit until cool enough to handle. Squeeze each head of garlic, gently pressing with your fingers to expel the cloves into a bowl. Stir the garlic with a rubber spatula to blend thoroughly. Use as needed, or store refrigerated in an airtight container. Bring a large pot of salted water to a boil. Add the spinach and cook for 2 minutes. Drain in a fine mesh strainer, pressing with a large spoon to release as much water as possible. Finely chop and set aside. In a large skillet, melt 1 tablespoon of the butter over medium-high heat. Add the shallots and garlic and cook, stirring, for 1 minute. Add the mushrooms, 1/4 teaspoon each of the salt and black pepper, and cook, stirring, until the mushrooms are tender and have given off their liquid, about 5 minutes. Remove from the heat and let cool. To make the bechamel sauce, in a large saucepan, melt the remaining 4 tablespoons butter over medium heat. Add the flour and cook, stirring with a wooden spoon, to make a light roux, about 2 minutes. Whisking constantly, slowly add the milk and continue to cook, stirring occasionally until thickened, 2 to 3 minutes. Add the remaining 1/2 teaspoon salt, 1/4 teaspoon black pepper, the nutmeg, and 1 cup of the Parmesan and cook, stirring, until thickened, about 2 minutes. Remove from the heat. In a bowl, combine the ricotta, fontina, and mozzarella cheeses. Fold in 1/4 cup of the bechamel sauce. Across the bottom of a deep-dish lasagna pan (13 by 9-inches), spoon enough bechamel sauce to cover (about 1/2 cup). Then add 1/4 of the mushrooms and sprinkle 1/4 of the spinach across. Arrange a layer of cooked noodles side-by-side across the sauce. Spread another layer of bechamel over the noodles and top with more spinach, mushrooms, and cheese. Repeat layering with sauce, noodles, spinach, and cheese 2 more times, ending with noodles on top. Sprinkle the remaining 1 1/2 cups of Parmesan over the top, cover tightly with aluminum foil, and bake until the noodles are tender and the lasagna is hot and bubbly, about 30 minutes. Uncover and continue baking until golden brown on top, about 10 minutes. Let rest for 10 to 15 minutes before serving. Serve hot. In a medium pot, heat the oil over medium-high heat. Add the mushrooms, onions, carrots, celery and garlic, and cook, stirring, for 5 minutes. Add the Madiera and cook until reduced, 3 minutes. Add the tomato paste, salt and pepper, and cook, stirring, for 30 seconds. Add the tomatoes, sauce, and water, and bring to a boil. Reduce the heat to low and simmer until thickened and fragrant, stirring occasionally, about 30 minutes. Add the herbs to the sauce and simmer for 5 minutes. Remove from the heat and adjust the seasoning, to taste. Add the pasta and toss to coat. Place in a large serving bowl, or divide among individual pasta bowls. Shave pecorino over the pasta. Cook egg noodles until just tender in boiling salted water, about 6 minutes. Saute sliced mushrooms and shallot in 2 tablespoons butter over moderate heat until mushrooms are tender, about 3 or 4 minutes. Drain noodles and toss in with cooked mushrooms. Add the parsley and season with a little salt, to taste. Bring a pot of water to boil for ravioli. While water comes to a boil, drain defrosted frozen chopped spinach by wringing it dry in a kitchen towel, working over a garbage bowl or your sink. Heat a medium skillet over medium heat. Add extra-virgin olive oil, 2 tablespoons or 2 turns of the pan, and the garlic. Saute garlic in oil 1 minute, then sprinkle spinach into the garlic oil. Add artichoke heart pieces to the pan and turn to combine and heat through. Season vegetables with and remove from heat to a bowl. Place skillet back on the heat and melt butter. Whisk flour into butter and cook 1 to 2 minutes. Whisk stock into flour and butter and let it bubble. Whisk in cream and Parmesan. Season sauce with nutmeg, salt and pepper and thicken 1 to 2 minutes. Preheat broiler to high. Set rack between middle of oven groove and top rack groove, about 8 inches from heat. When water boils, salt water, add ravioli and cook 4 to 5 minutes. Ravioli should be less than al dente, still a bit chewy -- it will continue cooking when combined with sauce and vegetables. Place a colander over ravioli as it cooks and add asparagus to it. Cut thin, trimmed asparagus into 2-inch pieces on an angle. Steam the chopped asparagus while pasta cooks, 2 to 3 minutes, until just fork-tender, but still green. Remove asparagus and add to bowl with spinach and artichokes. Place colander in your sink and drain ravioli. Drizzle a touch of extra virgin olive oil onto the bottom of a medium oval casserole or a rectangular baking dish and brush pan to coat evenly. Arrange a layer using 1/2 of cooked ravioli in the dish. Layer 1/2 of the cooked vegetables over the ravioli. Next, add a few ladles of sauce, then vegetables, then top casserole with the last of the ravioli. Dot top of "lasagna" with any remaining sauce and cover liberally with gratedprovolone or 4 cheese blend. Brown cheese 8 inches from broiler, 5 minutes. In a bowl combine the goat cheese, walnuts, basil, oil, garlic and lemon peel, and mix well. Set aside. Put pasta sheet on work surface with long side facing you and put packed teaspoon of filling 2 inches apart lengthwise along half of the pasta sheet (you should have 10 to 12 mounds). Around each mound of filling brush dough very lightly with water. Fold dough lengthwise in half over mounds of filling, gently pressing around mounds to force out any air, and seal edges well. With a fluted pastry wheel trim edges and cut between mounds of filling to separate ravioli. Line a large tray with a dry kitchen towel and arrange ravioli in 1 layer. Make more ravioli with remaining 2 pieces of dough and remaining filling in same manner, transferring to kitchen-towel-lined tray and arranging in 1 layer. Ravioli may be made 8 hours ahead and chilled on towel-lined tray, covered loosely with plastic wrap. Melt 2 tablespoons of the butter in large, heavy skillet over medium-high heat. Add the walnuts and cook, stirring, until brown and fragrant, about 3 minutes. Remove nuts from the pan. Add the remaining 2 tablespoons butter, shallots and garlic, and saute for 1 minute. Add the wine and cream, and bring to a boil. Cook over medium-high until the liquid has thickened and reduced by nearly 50 percent in volume, about 4 minutes. Stir in the basil, salt and pepper. Remove from the heat and cover to keep warm. Bring a large pot of salted water to a boil. Cook the ravioli until they are tender and rise to the surface, carefully stirring to keep them from sticking together, 3 to 4 minutes. Drain in a colander. Transfer the cooked ravioli to the pan with the sauce, and gently toss to coat and heat through. Divide the ravioli among 6 serving plates or shallow bowls, and sprinkle each serving with grated cheese. Serve immediately. Heat 1 cup of water to 110 degrees F. In a large mixing bowl, whisk together the water, yeast, 1 tablespoon olive oil, and salt until the yeast is dissolved. Add 1 1/2 cups flour to the yeast mixture, mixing by hand until all the flour is incorporated and no lumps remain. Continue adding flour 1/4 cup at a time working the dough by hand after each addition until all the flour is incorporated, yet the dough remains slightly sticky. Lightly oil a large mixing bowl with the remaining 1/2 teaspoon olive oil. Place the dough in the oiled bowl and turn to coat with olive oil. Cover the bowl with plastic wrap and set in a warm, non-drafty place. Allow the dough to rise until nearly double in size, about 1 hour. Remove the dough from the bowl and briefly work by hand, separating into 2 equal sized discs. Place the dough on a lightly greased sheet pan, cover with plastic wrap, and set in a warm, non-drafty place to rest for 15 minutes, or until ready to use. Heat 1 tablespoon olive oil in a skillet over medium high heat. Add the mushrooms and saute just until their juice has evaporated, stirring from time to time, about 4 minutes. Remove from the heat and cool. With your hands, gently stretch 1 dough disc to a 6-inch round. Place the dough round on a lightly greased baking sheet, and pat out to a 10 to 12-inch round, about 1/8-inch thick. Repeat with the remaining dough disc. Top each piece of dough with half of the mushrooms, half of the proscuitto, and 1 tablespoon of truffle oil. Sprinkle the cheeses over the mushrooms, and bake until the dough is brown and the cheese is bubbly, about 15 minutes, switching the pans between racks after 7 minutes. Serve immediately. Cook the pasta in a large pot of boiling salted water until tender but still firm to the bite, stirring occasionally, about 8 minutes. Drain, reserving 1 cup of the cooking liquid. Meanwhile, blend the sun-dried tomatoes and their oil, garlic, salt and pepper, to taste, and basil in a food processor and blend until the tomatoes are finely chopped. Transfer the tomato mixture to a large bowl. Stir in the Parmesan. Add the pasta to the pesto and toss to coat, adding enough reserved cooking liquid to moisten. Season the pasta, to taste, with salt and pepper and serve. Cook the pasta in a large pot of boiling salted water until tender but still firm to the bite, stirring occasionally, about 4 minutes. Drain. Stir 2 cups of the cream and the lemon juice in a heavy large skillet to blend. Add the butter and cook over medium heat just until the butter melts, stirring occasionally, about 3 minutes. Remove from the heat. Add the pasta and toss. Add the remaining 1/2 cup of cream, and Parmesan to the cream sauce in the skillet. Add the lemon zest, nutmeg, salt, and white pepper. Toss the pasta mixture over low heat until the sauce thickens slightly, about 1 minute. In a 2 quart saucepan, melt the butter over medium heat. Add the flour and whisk until smooth, about 2 minutes. Always stirring, gradually add the milk and continue to whisk until the sauce is smooth and creamy. Simmer until it is thick enough to coat the back of a spoon. This will take approximately 10 minutes. Remove from heat and stir in nutmeg, 1/2 cup fontina, prosciutto and season with salt and white pepper. Set aside. In a large pot, bring to a boil 6 quarts of salted water. Add the rigatoni and cook for about 5 minutes. Since you will be cooking the pasta a second time in the oven, you want to make sure the inside is still hard. Drain in a colander. Return pasta to the pot and pour in bechamel sauce. Using a wooden spoon, mix well until all the pasta is coated with the sauce. Into a greased 13 by 9-inch baking dish, pour the pasta with cream sauce. Smooth out top and sprinkle with remaining 1/2 cup fontina. Dot the top with diced butter and bake in oven for 25 minutes or until bubbling and the top is golden brown. Start by preparing and cutting all the vegetables and measuring your ingredients so that they are ready to go. Once you begin stir-frying, it goes very quickly. In a wok or large saute pan, heat canola oil over high heat to almost smoking. While stirring constantly, 1 at a time, add in the peppers and onions, followed by the squash, zucchini, eggplant, garlic, ginger, sesame oil, and teriyaki sauce. Cook for about 2 minutes and then add in the remaining ingredients and seasonings, except for the snow peas. Cook about 2 minutes more. Stir in snow peas when done and remove from heat. Serve immediately garnished with kimchee, if desired. Almond-shaped Kalamata olives from the Kalamata region of Greece range from dark purple to black in color. They have a firm texture and a rich, fruity flavor. 1. Cook pasta according to package directions, and drain. Set aside in colander, and rinse occasionally with cold water to prevent sticking. 2. Heat oil and crushed red pepper over medium-high heat, 1 minute, in Dutch oven or large electric frying pan. Add broccoli, onions, mushrooms, beans and olives, and cook for 5 minutes, stirring frequently. ?? 3. Add half of coriander, broth, stewed tomatoes, yeast and tomato sauce. Reduce heat to low, and cook 2 minutes. Add cooked pasta and remaining 1/4 cup coriander, and mix? thoroughly. Simmer 3 minutes, or until heated through, stirring occasionally. This warm-weather, one-pot meal is surprisingly light when fresh from the oven. An earthenware casserole is best because the slow radiant heat creates a crust along the edges that is one of the tastiest parts of the dish. Best eaten when just made, this dish will reheat well in a microwave oven. Kids love it. Place mushrooms in large heatproof container, and add boiling water. Cover, and infuse 1 to 2 hours, or until mushrooms are tender. Strain infusion, and reserve infusion liquid. Coarsely chop mushrooms, and set aside in large bowl. Place onions, butter and sugar in large skillet, cover and sweat over medium heat 10 minutes, or until onions are soft and beginning to caramelize on bottoms. Add salt, and stir in flour to thicken. Place onions in bowl, and deglaze skillet with about 1 cup mushroom infusion, whisking well. Pour deglazing liquid into mushroom infusion. Preheat oven to 375F. Spray 2-quart casserole with nonstick cooking spray. Layer bread in casserole. Chop any remaining bread into small irregular pieces, and set aside. Combine mushrooms and tomatoes, and cover bread layer with mixture. Combine Gruyère cheese and sage, and scatter evenly over mushroom-tomato mixture. Cover with chopped bread. Spread onions over bread, and add mushroom infusion. Pat smooth with back of wooden spoon. Sprinkle sapsago cheese and caraway seeds, if using, over top. Bake uncovered 45 to 55 minutes, or until set and crispy on top. Serve hot directly from oven. Combine cooked rice, milk, sugar and butter in a medium saucepan. Add raisins and vanilla. Cook for 25 minutes until most of the liquid is absorbed. Mix in lemon zest and 1/2 teaspoon of cinnamon. Spoon pudding into a serving dish and dust with remaining cinnamon. May serve chilled or at room temperature. Preheat oven to 350 degrees F. Grease and flour 3 (9-inch) cake pans. To make the cake: Using an electric mixer, cream butter until fluffy. Add sugar and continue to cream well for 6 to 8 minutes. Add eggs 1 at a time, beating well after each addition. Add flour and milk alternately to creamed mixture, beginning and ending with flour. Add vanilla and continue to beat until just mixed. Divide batter equally among prepared pans. Level batter in each pan by holding pan 3 or 4-inches above counter, then dropping flat onto counter. Do this several times to release air bubbles and assure you of a more level cake. Bake for 25 to 30 minutes or until golden brown. Cool in pans 5 to 10 minutes. Invert cakes onto cooling racks. Cool completely. To make the frosting: Place sugar, cream of tartar or corn syrup, salt, water, and egg whites in the top of a double boiler. Beat with a handheld electric mixer for 1 minute. Place pan over boiling water, being sure that boiling water does not touch the bottom of the top pan. Beat constantly on high speed with electric mixer for 7 minutes. Beat in vanilla. To make the filling: Place the ingredients in the double boiler over boiling water. Don't let top pan touch the water. Cook and stir until mixture begins to gel or thicken. Remove from heat and allow to cool. To assemble, add 1 tablespoon of filling to the cake pedestal. Run hands along the side of the cake to remove excess crumbs. Place the cake layers on the pedestal, spreading filling between the layers and on top. Spread the sides and top of the cake with the remaining filling. Frost top and sides of cake with frosting. Garnish with a lemon wedge and a sprig of mint. In a large roasting pan, spread the onions, leeks, mushrooms, carrots, celery, turnips, parsnips, squash, zucchini, tomatoes and garlic cloves. Drizzle with the olive oil, and season with the salt and pepper, stirring to coat. Roast for 45 minutes, stirring, every 15 minutes to brown evenly. Remove from the oven and transfer to a large pot. Add the water and herbs, and bring to a boil. Reduce the heat and simmer for 20 minutes, skimming to remove any foam that rises to the surface. Add the wine and cook for 30 minutes. To make the pasta dough: In an electric mixer fitted with a dough hook, combine the flour and salt. Add the eggs, 1 at a time, and continue to mix. Pour in 1 tablespoon olive oil and continue to mix until a smooth dough is formed. If the dough is too dry drizzle in a bit of water, if it is too wet sprinkle in some more flour. Dust some flour on a work surface, knead and fold the dough until it is elastic and smooth, this should take about 10 minutes. Brush the surface of the dough with the remaining olive oil and wrap the dough in plastic wrap; let rest for about 30 minutes to allow the gluten to relax. To make the dough by hand: Combine the flour and salt on a flat work surface, shape into a mound, and make a well in the center. Add the eggs and 1 tablespoon olive oil to the well and lightly beat with a fork. Gradually draw in the flour from the inside wall and mix it with the beaten eggs. Use 1 hand for mixing and the other to protect the outer wall. Continue to incorporate all the flour until it forms a smooth dough. Dust some flour on the work surface; knead and fold the dough until it is elastic and smooth, this should take about 10 minutes. Brush the surface of the dough with the remaining olive oil and wrap the dough in plastic wrap; let rest for about 30 minutes to allow the gluten to relax. To roll out the dough: Cut the ball of dough in half, cover and reserve the piece you are not using to prevent it from drying out. Dust the counter and dough with a little flour. Press the dough into a rectangle and roll it through a pasta machine set at the widest setting 2 or 3 times. Guide the dough with your hand as it emerges from the rollers to prevent it from puncturing or stretching. Dust the sheets with extra flour whenever the dough gets sticky. Reduce the setting and crank the dough through again 2 or 3 times. Continue reducing the setting and rolling until the machine is at its narrowest setting; the dough should be paper-thin, about 1/8-inch thick for ravioli. Roll out the other half. In the bowl of a heavy-duty electric mixer fitted with a dough hook, combine the yeast, sugar, and warm water; stir to blend. Let stand until foamy, about 5 minutes. Stir in the salt. Add the flour, a little at a time, mixing at the lowest speed until most of the flour has been incorporated and the dough forms a ball. Continue to mix at the lowest speed until the dough has become a sticky ball and pulls away from the sides of the bowl; about 4 to 5 minutes. Dust the counter lightly with flour. Knead the dough by hand for a minute and form into a ball. Transfer the dough to a bowl, cover tightly with plastic wrap, and let it sit in a warm spot for 2 hours to rise. To form the baguettes: Cut the dough into 4 equal pieces. Press each piece of dough into a rectangle and fold the long sides up into the middle. Roll each into a log, taking care to close the seam. Taper the ends by gently rolling it back and forth. Lay the baguettes on a sheet pan that is dusted with cornmeal and cover with a towel. Let the baguettes rise for another 2 hours. With sharp knife, make 4 or 5 diagonal slashes across the top of each loaf. Brush the tops of the loaves with milk. Bake for 40 minutes, until the bread is golden brown. Cool on a wire rack. Combine the biscuit mix and cheese in a small bowl. Add the water and stir just until combined. The dough will be slightly moist. Drop the dough by tablespoonfuls onto the prepared baking sheet. Bake for about 10 minutes, until the biscuits are firm and beginning to brown. While the biscuits are baking, make the garlic butter. In a small bowl, combine the butter, garlic powder, salt, and parsley flakes. Mix well. As soon as you bring the biscuits from the oven, brush them with the garlic butter using a pastry brush. Using a food processor, gently process the bell pepper, onion, carrot, and parsley, being careful not to over process. Cut 1/2 of the cabbage into chunks and place in the food processor and process lightly, making sure the cabbage doesn't become mushy. Slice the remaining cabbage thinly. Mix the cabbage together with the processed vegetables. In a separate bowl, mix the remaining ingredients together and allow to stand for a few minutes. Combine the mayonnaise mixture with the vegetables and toss. Chill for 1 hour. Heat the veggie broth in a medium saucepan and keep warm over low heat. Heat 1 tablespoon of oil in a large skillet over medium heat. Add 1/2 onion and 1 clove garlic, cook, stirring, until translucent, about 5 minutes. Add the fresh mushrooms, herbs and butter. Saute for 3 to 5 minutes until lightly browned, season with salt and pepper. Drizzle in truffle oil then add the dried porcini mushrooms which were reconstituted in1 cup of warm chicken broth. Season again with salt and fresh cracked pepper. Saute 1 minute then remove from heat and set aside. Coat a saucepan with remaining 2 tablespoons of oil. Saute the remaining 1/2 onion and garlic clove. Add the rice and stir quickly until it is well-coated and opaque, 1 minute. This step cooks the starchy coating and prevents the grains from sticking. Stir in wine and cook until it is nearly all evaporated. Now, with a ladle, add 1 cup of the warm broth and cook, stirring, until the rice has absorbed the liquid. Add the remaining broth, 1 cup at a time. Continue to cook and stir, allowing the rice to absorb each addition of broth before adding more. The risotto should be slightly firm and creamy, not mushy. Transfer the mushrooms to the rice mixture. Stir in Parmesan cheese, cook briefly until melted. Top with a drizzle of truffle oil and chopped parsley before serving. Into a medium mixing bowl, sift the self-rising flour, cake flour, baking powder, baking soda, salt and sugar. Using your fingers or a pastry cutter, work the butter into the flour until there are no butter pieces larger than a pea. Add the heavy cream to the flour mixture and, using your hands or a rubber spatula, stir just until the cream and flour come together to form a dough. Sprinkle some of the all-purpose flour on a flat surface and place the dough on top of the flour. Using your hands, press the dough into a 1/2-inch thick disk about 8 inches in diameter. Using a 3-inch round cutter dusted in flour, cut the dough into circles. Be sure to press straight and downward when cutting the dough -- a twisting motion will prevent the dough from rising. You will need to reform the scraps of dough in order to have 8 biscuits. Do this by pushing the scrap pieces together and press to reform into a 1/2-inch thick disk. Place the biscuits on a small sheet pan and brush the tops with the melted butter. Bake in the oven for 10 to 12 minutes, or until golden brown. Allow to cool briefly and serve while still warm. Preheat the waffle iron according to the manufacturer's instructions. In 1 medium bowl sift together flour, baking powder, and salt. Set aside. In a second bowl use the wooden spoon to beat together the egg yolks and sugar until sugar is completely dissolved and eggs have turned a pale yellow. Add the vanilla extract, melted butter, and milk to the eggs and whisk to combine. Combine the egg-milk mixture with the flour mixture and whisk just until blended. Do not over mix. In third bowl, beat the egg whites with an electric mixer until soft peaks form, about 1 minute. Using the rubber spatula, gently fold the egg whites into the waffle batter. Do not overmix! Coat the waffle iron with non-stick cooking spray and pour enough batter in iron to just cover waffle grid. Close and cook as per manufacturer's instructions until golden brown, about 2 to 3 minutes. Serve immediately. Preheat oven to 425 degree F.
Sprinkle the cheese over the bottom of the pie shell, then evenly distribute the onion, broccoli, and mushroom over the cheese layer. Mix the eggs and the spices together in a bowl. Add the milk and half-and-half and mix well. Pour over contents in the pie shell. Cut the cherry tomatoes in halves and place, cut side up, in a ring on top of the mixture. Sprinkle the 1 tablespoon of Romano over top. Bake for 15 minutes. Turn oven down to 300 degrees F and bake an additional 45 to 55 minutes or until cake tester inserted in middle comes out clean. Blend together with pastry blender until crumbly (like coarse cornmeal). Add cold water, 1 tablespoon at a time, mixing with a fork until mixture will hold together. Handle as little possible. Wrap in plastic wrap in a "patty" and chill for at least an hour. Roll out between Saran Wrap with very little flour. Place carefully in a pie plate, being careful not to stretch dough. Trim the edges. Rice can be tricky. For 4 servings of white rice (long or short grain), measure out 1 cup of rice, 2 cups of cold water, and a sprinkle of salt into a small saucepan. Bring the water to a boil, stir once, reduce the heat to medium low, cover the pan, and cook for 12 to 15 minutes or until the water has evaporated. You can tell the water has evaporated two ways. First, there are little holes that separate the rice. Second, the water changes from sounding like boiling, to sounding like popping. Remove rice from the heat and let it sit, covered, for 5 minutes. Now it's ready to serve. To cook 4 servings of brown rice, use the same procedure but increase the water amount to 3 cups for every 1 cup of brown rice, and check it after 27 minutes (an exact number to be sure). Or, you could try Sara Moulton's "spaghetti method." Bring a large pot of salted water to a boil, add the rice (either kind) and boil for approximately the same amount of time, or until it is done to your taste. Then drain the rice, as you would pasta, through a fine sieve. Either way, it's better to use regular rice, not the parboiled "quick" kind. Regular rice has a better texture and more nutrients. Combine water, say sauce, salt garlic powder, curry powder and cooked peas. Add rice by pouring it into the center of the pot until it reaches the top of the water line-NO MORE. Stir well and cover. Continue cooking on a medium to low flame until rice is fluffy and cooked through. Garlic bread goes well with many pasta dishes, as well as poultry, beef and fish. It is a dinner staple that is guaranteed to please. Makes two loaves. In a small food processor or a blender, puree garlic with salt, butter and oil until smooth. Wrap baguettes loosely in foil and bake for 10 minutes. Open foil to expose the tops of baguettes and bake for 5 more minutes, or until hot and crusty. If the sauce cools down too much for the cheeses to fully melt, return it tothe heat briefly. Don't let it come back to a simmer, or the sauce will separate. Taste and season very lightly with salt, if necessary. Remember, the cheeses are slightly salty, so you won't need much. Tips: White cheddar tastes the same as "normal" yellow cheddar; it's just not dyed. A yellow cheddar will make the sauce yellow. To make a great homemade macaroni and cheese, toss the finished cheese sauce with cooked elbow macaroni, place in a shallow casserole dish and top with breadcrumbs. Bake at 375 degrees until the breadcrumbs brown. y experimenting with different cheeses. Blue cheese, gorgonzola, asiago, romano and many others will work well and will add different flavors to the sauce. Email us with your Best Recipes.